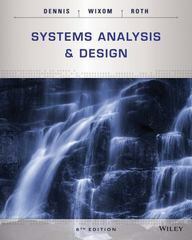 Systems Analysis and Design 6 Edition The 6th Edition of Systems Analysis and Design continues to offer a hands-on approach to SAD while focusing on the core set of skills that all analysts must possess. Building on their experience as professional systems analysts and award-winning teachers, authors Dennis, Wixom, and Roth capture the experience of developing and analyzing systems in a way that students can understand and apply. With Systems Analysis and Design, 6th Edition, students will leave the course with experience that is a rich foundation for further work as a systems analyst.